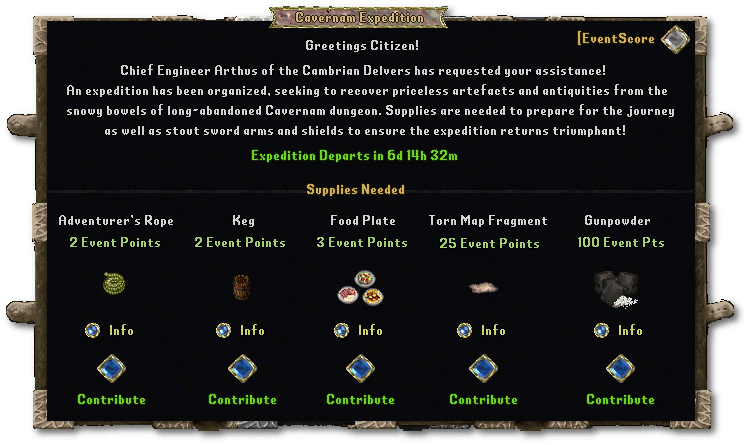 EVENT: Supply the Cavernam Expedition! The Cavernam Expedition is seeking supplies for their upcoming trek. Visit Cambria Bank and double-click the Event Sign to contribute! Type [eventscore to see your progress. Players can craft specific items as well as have a chance of finding event items as loot on any monster (excluding the NPD) which can be turned in for Event Points. This event will end on Saturday, January 26th at 6pm EST! Visit the forums for more information on the Cavernam Expedition Event!